When surveyed 74% of retail customers report waiting in the checkout line as their least favorite aspect of shopping. What if you could make three quarters of your customers happier? Simple – don’t make them wait! What would that mean in terms of repeat business, “word of mouth,” and, ultimately, your bottom-line? 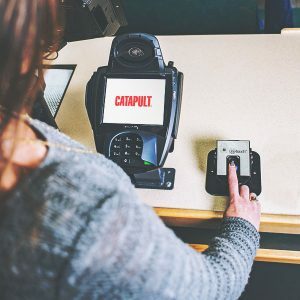 The Secure OneTouch fingerprint reader for the Catapult POS software suite is one such solution and is designed to reduce the friction at the checkout and streamline customer and employee tracking. This idea is simple, secure, convenient, and it’s very fast. Secure OneTouch simplifies customer and employee identification at the POS checkout for customer tracking, loyalty program identification, promotion and discount redemption, accounts receivable, as well as Catapult Membership Module tracking. The device can also be used by employees to log in and out of the point of sale, and to approve voids and refunds and other transaction adjustments at the cash register. As a result, merchants can eliminate the need for costly member cards, key-tags, employee ID badges, telephone numbers, last names, or any other media to identify customers and employees. 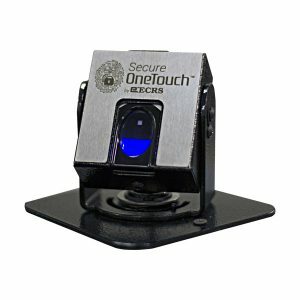 The Secure OneTouch uses fingerprint biometrics so that customers and employees can associate themselves to their store account with only a single touch. The unit’s biometrics reader scans dozens of points from the user’s fingerprint, offering ultimate security. The moment the customer touches the biometric reader, the system begins searching for the associated customer record. If the biometric scan is matched to an encrypted customer record, the system will associate the customer to the transaction. Don’t worry. This isn’t Big Brother. The biometric reader simply uses a mathematical algorithm to convert metrics from unique fingerprint data into a number, and then uses that number as a password. No pictures of any fingerprints are stored on the POS. Biometrics readers are on all sorts of devices now, and your customers have already grown accustomed to the technology. So although some may choose to use a different method of identification – that’s ok! Catapult can easily accommodate those customers as well. In our experience however, most customers will appreciate the merchant’s efforts to provide a unique, more secure, and easier POS experience.